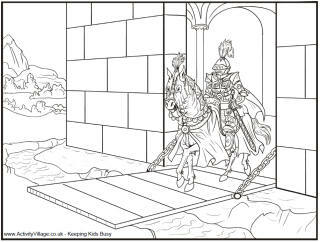 All the excitement of a Medieval joust is captured in this wonderful, detailed colouring page. The two knights have clashed in the middle of the tilt with lances extended, and one is definitely coming off better than the other. With their ornate, heavy armour and a horse skittish from the joust, it is not surprising that Medieval knights needed a squire to help them dismount - and of course it would have been even more difficult if they had been hurt in the jousting. This brave knight is ready for the joust: in full Medieval armour, carrying his lance proudly and sitting astride his wonderfully dressed-up charger, he would have made a real spectacle in the tilt and attracted many admirers. 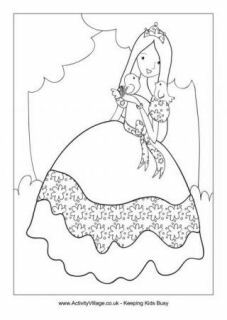 A gallant medieval gentleman kneels to be knighted by a queen or princess in this colouring page for older children. 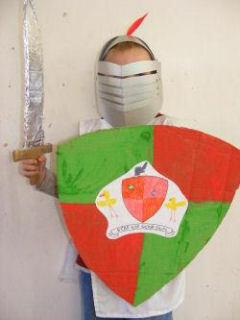 Colour in this picture of a brave Tudor knight in full armour, ready for a joust!